Take control of the complexities of managing your business at every level with MYOB Exo Employer Services. In today’s commercial and regulatory environment, managing staff effectively is one of the keys to a successful business. 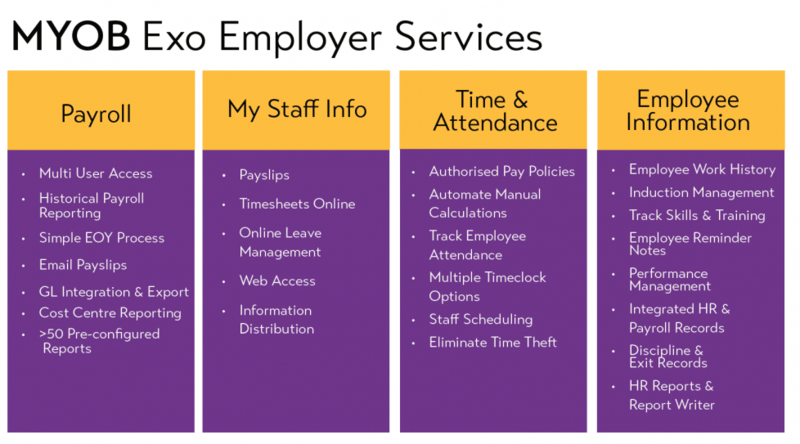 MYOB Employer Services products are designed to help medium and larger companies easily streamline payroll, manage staff leave, plan rosters and more – even in the hardest to reach working environments. MYOB Employer Services is a fully integrated suite of Human Resource Management software which provides full visibility to improve efficiency and empower your workforce. Every product is part of an integrated business solution, with full compatibility across the MYOB Employer Services family and with MYOB’s other mid-market products and services. MYOB Payroll complies with the new Single Touch Payroll requirements and has been tried and tested on hundreds of sites, ensuring a seamless transition to S.T.P. Payroll – This complete management tool will remove the hassle of having to manually calculate earnings, taxes and deductions by doing it for you. Timesheets –MYOB Exo Payroll can receive data directly from remote sites to reduce the burden of timesheet entry workload through this electronic, automated process. Employee Information –Stay up-to-date with all your staff information through management and tracking tools. Housing all your HR information in one place will streamline your information and allow you to keep track of employee movements. My Staff Info – Reduce payroll staff hours with MyStaffInfo, allowing employees access to payslips, the ability to apply for leave and view their own holiday entitlements online. Timeclock – Integrate this module with Exo Time and Attendance for a complete capture solution to managing staff hours using biometric finger scanners, magnetic swipe cards or barcodes. MYOB Employer Services will manage, streamline and automate manual labour from planning rosters to communication within employees. MYOB Exo Employer Services embraces your businesses change and growths through benefits such as simplifying intricacies of management, enhancing payroll reporting and empowering your team. Flexible processing and reporting multi-level cost centre analysis with unlimited costing per employee. MYOB ES enables open communication and clear management practices within the workplace. Empower your workforce by giving them 24/7 visibility of their own secure information and details with a central repository for all your staff information. Choosing the right solution is complicated. Kilimanjaro believes it is important to have a trusted advisor guide you through these decisions to ensure your business requirements are being met. Contact us to speak to an accredited payroll expert who can guide you to determine if this suite of products will create efficiency and solve the problems in your business.